Retired Army Colonel and IBDA member, Steve Bosan, has been kind enough to forward some of his career highlights and his associations with the L-19 Birddog and other aircraft. He enjoyed over 24 years of active duty flying and you’ll find his story quite interesting. His military career included time during WWll all the way to the war in SEA and beyond. 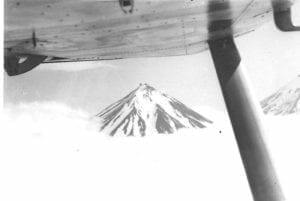 Our thanks goes out to Col. Bosan for sharing his story and included photographs with us. In 1944 I was a 2nd Platoon Commander in a combat engineer battalion in Patton’s 3rd Army. 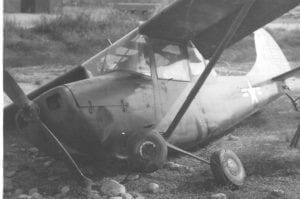 Several times I came up on an L4 Aircraft parked alongside HQ Tents along the dirt roads as well as the autobahns. I also saw them flying around the battle areas. I knew they were used for artillery fire and transport. Little did I know that some day I would be a pilot in them. I got out of the Army in December 1946 and joined an aviation Engneer Battalion ( a reserve unit) in Miami, Florida. In 1951 it was recalled to active duty for the Korean War. We were sent to Ft. Huachuca, Arizona for training prior to going overseas. While there, we had a course in camouflage and we got to fly in an L-19 to view or work at hiding our engineer equipment. This was my first association with the L-19. It was great! I was then sent to Fort Belvoir, Virginia for more training and got to fly in an L-20 and H-13. When I got back to Fort Huachuca the Army pilot there encouraged me to apply for Army Aviation which I did. I was accepted and entered San Marcos AFB in Texas for primary flight training in 1952. There we fley the Piper Cub. In January 1953 we went to Fort Sill at Post Field for Tactical Training in the L-19. We became Army Aviators in April 1953. My first assignment was with the 30th Topo Battalion in Presidio of San Fransisco with duty in the field in Alaska. 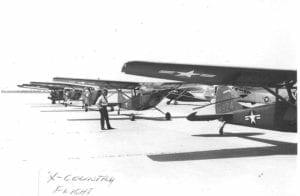 I was given orders to ferry an L-19 to Alaska along with CPT Charlie (Ace) Keiffer who had been an aviator in the constabulary in Germany flying L-5’s. He certainly had some fantastic stories to tell. I never knew how much to believe. We left Crissy Field and our first RON was in Twin Falls, ID. Then we cleared customs in Canada and chose to follow the Alcan Hwy. It was very easy because there were Canadian Maintenance Buildings every 40 miles or so and we circled them so the men could read our tail number and they knew where we were along the Alcan. We arrived in Anchorage, Al and I was assigned to Cold Bay way down on the Aleutian Chain. I had an L-19 and a crew chief. My job was flying up and down the field camps with people and cargo between Cold Bay, Port Heiden and Port Moler which was some 200 miles one way. Most of my flying was along the beach at an altitude of 10 feet. Now picture a new Aviator right out of flight school flying in some of the worst weather in the world with winds of 60 knots and fog. No instrument training except for about 5 hours in an L-5 and you get the picture. However, there were many exciting sights there as there were three active volcanoes along my route and a great deal of wildlife. A large herd of caribou of about 1500, Kodiak bears and all kinds of birds. We chartered amphibians from Reeves Aleutian Air (a Gruman Goose) which I got to fly. We also had L-19s on floats. At the end of the summer we were back at Crissy Field and I had orders to Korea with helicopter training en route. So back to San Marcos AFB for basic helicopter training in an H-13 and then to Post Field at Fort Sill for Tactical Training along with transition in the Hiller H-23 which was only 5 hours. Instead of flying to Korea I got lucky ??? and went on a troop transport from Fort Mason, CA to Japan. When I arrived at 8th Army I was assigned to the 5th Light Aviation Section which supported 10th Corps on the 38th Parallel. I became commander and KMAG took over. 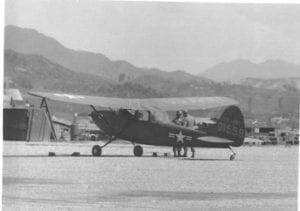 We moved to Wonju to K-46 Airfield. We had 12 pilots, 43 EM, 5 L-19’s, 3 H-13’s, and 2 L-20’s. So I got to fly the L-19 a lot. Since I was the commander, my boss General Johnson made me fly him and 4 Star General Pak who was the commander of the 1st ROK Army. 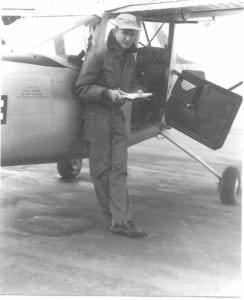 When I completed my tour I was assigned to the North Dakota National Guard as the Aviation Advisor. This was at Bismark, ND. They had about 10 Aviators, 5 L-19’s, 2 H-23’s, 1 L-17, one D Model L-19 and a new L-20. It was a great assignment except for the cold weather. The Governor decided he wanted to use National Guard aircraft so I got stuck flying him in the L-17 or L-20 almost every weekend. I think we visited every town in North Dakota. I had to go to Ellsworth AFB in Rapid City, SD for my flight physical, so I took an L-19, filed a flight plan as you could not land at a SAC base with out permission. I called for landing and was given a straight in approach. At about 1/4 mile final I was asked to land short or expedite my landing. There was a B-36 waiting to take off with all 10 engines running. I put the barn doors down and landed just over the approach lights, turned and taxied under the wing of the B-36. The b-36 came on the radio and made some kind of comment about the size of the flies around Rapid City. After two years, I received orders to South America for more topo flying. I also got 6 months TDY en route at Utah State University to complete my degree. This was at Logan, Utah. I wrote a letter to the Utah National Guard asking if I could come to Salt Lake City to keep my flying time up in their aircraft. I was really surprised when they flew an L-19 up to Logan Airport for my use for the whole 6 months. They even has an H-23available for me in Salt Lake City. At the time I was there I also made Regular Army and got a change of orders to Fort Eustis, VA. Now I was Transportation Corps. After Advanced Course and Maintenance Course, I was sent to Germany and then Verdun France as commander of an H-34 Company. This was in 1959 to 1961. We had some interesting missions. In 1961, General James Gavin, who was commander of the 82nd Airborne in WWII, arrived in France as the US Ambassador. We had the task of flying him and his wife around Southern France on a good will tour. we also provided Hollywood with air support when they shot the movie The Longest Day and got to meet some famous movie stars. We also kept two H-34’s in Paris full time supporting SHAFE. My last year in France was when I served as Staff Aviation Officer. I flew the L-19 in France and it was always my favorite. After C&GS, I was in the Pentagon as the Assignment Officer for 1800 TC Aviators and sent almost all of them to Vietnam. Then I sent myself. In Vietnam, I was the Battalion Commander of the 14th TC Aircraft Maintenance Battalion. With HQ’s at Nha Trang and 10 companies and 2500 men spread all over the Northern part of South Vietnam. We provided direct and general support to all aviation units North of Siagon and backup general support to the First Cav Division. After the Tet Offensive, we had a ton of damaged aircraft to repair or ship back to CONUS. 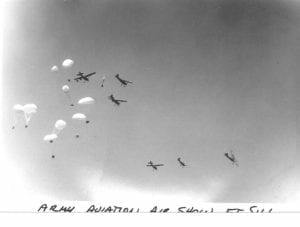 We also maintained a supply point for all types of aircraft and helped Air America with their HUEYS. After Two more tours in the Pentagon on the Army Staff and JCS, I had a tour in CDC and my last tour was Director of Maintenance at New Cumberland Army Depot for rebuild of the Chinook Helicopter. Lucky me; I stayed on flight status the whole time, a period of 24 years. I retired in 1976 in Camp Hill, PA where I still reside. I hope I can attend one of the IBDA events. I would love to see an L-19 again.